"People think that babies are sweet, I'm not I'm really bitter"
I like to think that the release of Prevenge so close to the launch of Bridget Jones Baby is one of those delicious irony things but, if it was planned, then it is the best marketing hook ever! 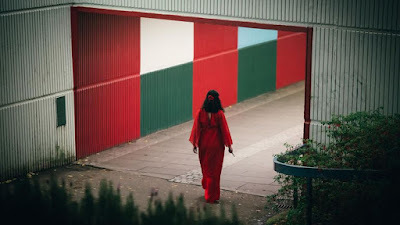 A sort of antidote to the sugary sweet bland fair that is normally on offer for a film that centres around new life and birth, Prevenge is that rarest of dark horror, slash, thrillers that has a perfect balance of pitch black humour and blood red violence. The market place section on Amazon is strewn with 1p priced examples of films that got the comedy/ horror balance so horribly wrong that the film sunk without a trace. There is so much to like about Prevenge and Alice Lowe has written, directed and starred in a feature that manages to hugely entertain but also has a powerful and valid message for our society. Prevenge is the story of Ruth (Alice Lowe) and her relationship with a very vocal but, as yet, unborn child. Right from the outset there is something intriguingly different about Ruth, it's a disconnect from life that becomes increasingly unsettling as the opening scene plays out. For many pregnant women, the journey to birth is a scary and disturbing path that is littered with trials and huge challenges both physical and mental. Ruth has a rather individual challenge, her unborn child is a murderous psychopath who uses its own mother as a weapon of gory mass destruction. Lowe is captivating as the murderous mother-in-waiting on a rampage and her dead pan delivery of the razor sharp script is perfection. As her story unfolds and the reasons for her actions become clear, the deliberate tonal shifts mirror the stages of pregnancy both Lowe and her character experience. It is key to understand that Lowe was pregnant both when she wrote and performed Prevenge and her characters baby bump is a real one. Lowe is accompanied by a stellar supporting cast and all are outstanding in their portrayal of a group of self centred and uncaring individuals. Gemma Whelan, Kayvan Novak and Tom Davis merit specific mention with Whelan's final scenes providing the audience with some fantastic and well paced comedy. Jo Hartley's portrayal of Ruth's midwife is well researched and has an authentic feel in the delivery (no pun intended). Quite why medical professionals feel they have to refer to a baby in the irritating 3rd person has been a constant source of annoyance to me. "When baby arrives..." it's "the" baby. THE baby! Hartley's midwife acts as the voice of conscience and reason to Ruth's murderous tendencies and this adds a real balance and depth to Prevenge. In a society where we are constantly led to believe that a woman is only complete when she has given birth and becomes a mother, this is a welcome film. In portraying pregnancy in a realistic, albeit extreme, light, Lowe has developed a film that will have a huge resonance both with mothers and mothers to be. We may not actually act out the huge swings of emotions that are endured by expectant mothers but they are normal and a part of the whole experience. To portray pregnancy as a glorious and magical journey ending in the birth of new life often resorts in many mothers feeling inadequate and that they are doing it wrong. Prevenge provides an anthemic call for reason and balance when discussing pregnancy which should be listened to in all quarters. It also highlights examples of the horrific and abhorrent treatment of women even in our so called fairer society. To treat a pregnant lady in any other way (whether she is looking for employment or undertaking any other life activity) is something that should have died out decades ago. Yet, employers will still not look at employing an expectant mother because of a conflict of priorities or lack of commitment. This can and still happens and it is this sort of discrimination that Prevenge rails violently against. Personally, I absolutely love that Lowe was actually pregnant during the film's production as it sends a strong message out of support for anyone who has ever felt less than a person because they are carrying a child. Prevenge is one of those rare finds, it is a near perfect example of what can be achieved by a talented actress and director who is truly learning her creative craft. Lowe has constantly demonstrated she refuses to compromise her vision and standards and Prevenge represents a new chapter in what is already a glittering career. Just go and see it!